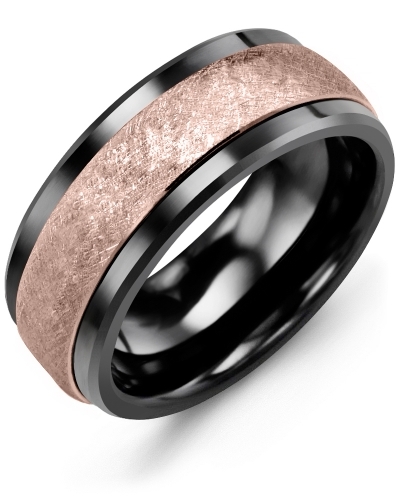 MKE - Wedding Ring for Men with Hand Finished Brush Design One of the most conservative wedding rings in our extensive collection, this sensational Tungsten ring, Cobalt ring, or Ceramic ring with hand brushed gold insert is an exquisite piece of jewelry. The perfect example of ‘less is more’, this elegant wedding ring for men is available in several variations including different ring widths, gold color and gold karat. You can personalize the inside with our engraving service. One of the most conservative wedding rings in our extensive collection, this sensational Tungsten ring, Cobalt ring, or Ceramic ring with hand brushed gold insert is an exquisite piece of jewelry. The perfect example of ‘less is more’, this elegant wedding ring for men is available in several variations including different ring widths, gold color and gold karat. You can personalize the inside with our engraving service. MADANI is the best! Craig assisted me throughout the entire process, answering any and all questions in a quick and timely manner. The ring was better than anticipated and I couldn’t be any happier with the entire experience.